Sandow Birk seems to be painting from headlines discarded by CNN for being too obviously confabulated. To pick one, "Chicago Police SUV Hauling Cart of Skulls Runs Over Black Man" is worked into The Triumph of Fear (2016). As is clear from the title, it's shooting for Bruegel, but it stalls at the level of Mad Magazine. Like any propagandist, Birk is more at home in the realm of printmaking. A series of lithographs from 2017 caricatures the president and his party with distinctly 19th-century savagery. Even more effective is American Procession (2017), an enormous three-panel offset print. The parade on the left starts with Lincoln and ends with figures bearing the flag of California and signs lauding Obamacare. The one on the right begins with Confederate slavers and ends with Trump standing with a crowd throwing Nazi salutes. Effective, that is, visually. As politics it's saddening. Fascism is not imminent and the role it plays in the left-liberal imagination does it no service. A more thoughtful artist would envision a way out of that foolishness, not further into it. 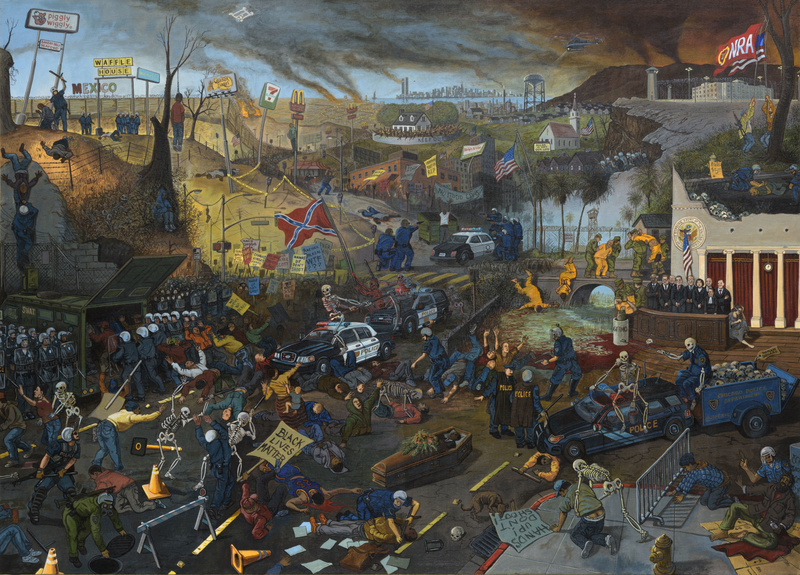 Image Sandow Birk, The Triumph of Fear, 2016, acrylic on canvas, 46 x 64 inches, courtesy of P.P.O.W.